Bellver Castle is a Gothic style castle on a hill 3 km northwest of Palma on the Island of Majorca, Balearic Islands, Spain. 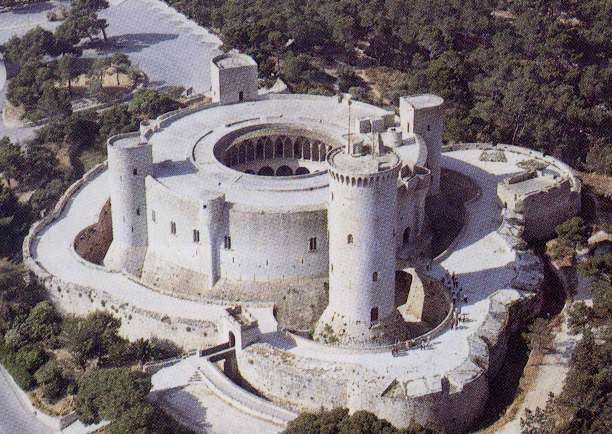 It was built in the 14th century for King James II of Majorca, and is one of the few circular castles in Europe. Long used as a military prison throughout the 18th to mid-20th century, it is now under civilian control, being one of the main tourist attractions of the island, as well as the seat for the city's History Museum. The main part of the fortification was built by architect Pere Salvà, who also worked in the construction of the Royal Palace of La Almudaina, together with other master masons between 1300 and 1311 for king James II of Aragon and Majorca. Rock from the hill where the castle sits was used for the building, which has eventually led to the appareance of cracks. Having been built as a seat for the royal court of James II of Mallorca, its structure combines the needs of a palace with defensive elements. The most noted feature in its structure is its circular shape, unique in Spain. Both its surrounding wall and the inner yard are circular, and so are the three minor towers and the donjon. A moat is found surrounding the castle and its donjon. The circular inner yard must be highlighted. It has a well in the middle of it, which indicates there is a cistern underneath. The palace itself is structured as a two-story building around the central yard. All its dependencies face this yard through a gallery of gothic semi-circular arches. Are you a journalist, photographer or videoreporter travel and have material for Bellver Castle?